Yes I have shad on my mind. I anxiously look out the window from my offices in Rosslyn overlooking the Theodore Roosevelt memorial, an island on the Potomac river. The TU National Capitol Chapter recently helped the National Park Service and local government to refurbish docks at the historic Fletcher’s Cove boathouse to ensure anglers will be able to pursue this worthy fish in just a few weeks. Shad really were the food item that fueled the birth of this nation. You’ve got to pickup The Founding Fish by John McPhee if you’re an angler or care about fisheries management. Melissa’s Lesh’s film just won first runner up at 2015 RVA Environmental Film Festival. 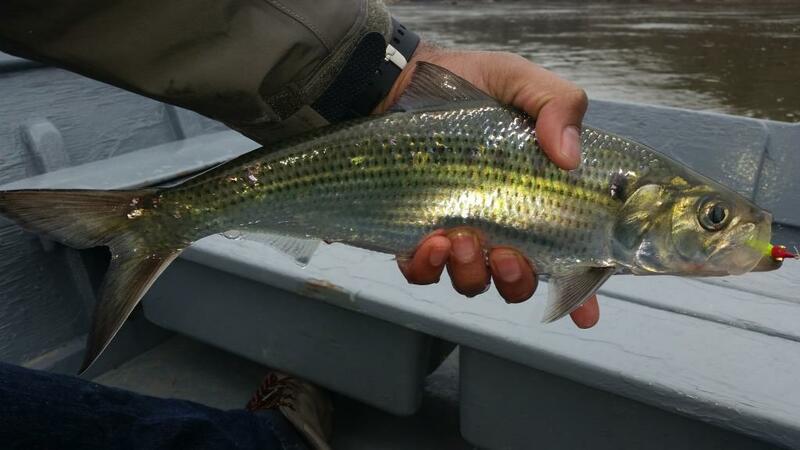 Produced by VCU Life Sciences’ Outreach Education Coordinator Anne Wright for the Science in the Park website, and narrated by former James River Park Manager Ralph White, the film documents the plight and management of blueback herring and American shad in the James River. The film features interviews with Michael Odom, Hatchery Manager of the Harrison Lake National Fish Hatchery, and Alan Weaver, Fish Passage Coordinator for the Virginia Department of Game and Inland Fisheries. 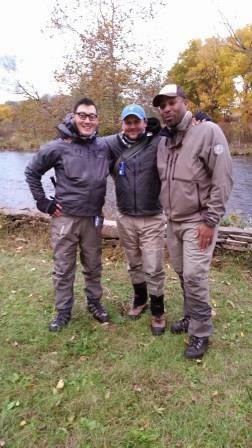 So I turned 40 last year and my wife was gracious enough to allow me not one but two fishing trips with buddies. I took them throughout the fall and early winter. 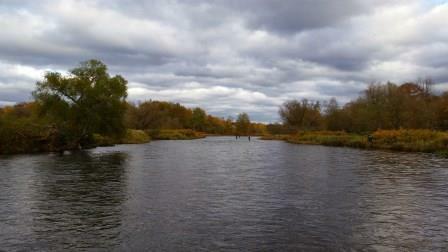 My first trip was to Pulaski in NY to the famed combat-fishing stream known as the Salmon River. For many East Coasters this is as good as it gets. 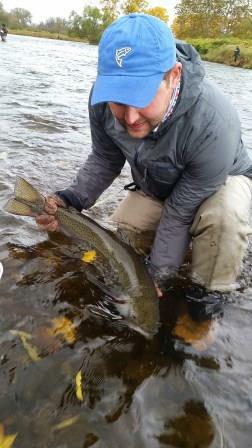 An easy flight from the Eastern seaboard to Syracuse will land you within a 2-3 hour drive of several good migratory rivers off Lake Ontario for big browns, Chinook, Silver salmon, big resident rainbows, and two varieties of lake-run Steelhead (Skeena and Washington-strain). And because Canada stocks just about as much as the US, there’s the genetic drift of their stocked salmonids as well. All this adds up to thousands of fish making runs into the Ontario tribs on both sides of the border to do one of two things – spawn, or eat spawn. I called up my two closest fishing buddies, Mark and Daniel of the original Gowanus Noodlers, and we hit it in early November. Guests of the wonderful, new and luxe, Tailwater Lodge, we had impeccable accommodations in a converted schoolhouse that sits on the river. 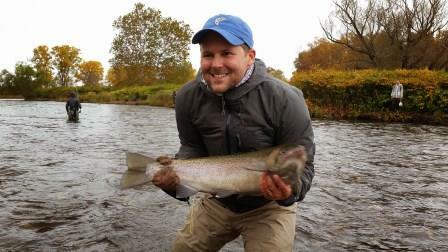 We were also guests of the Douglaston Salmon Run, a fine fishing camp that has the first two miles of the Salmon river. The camp’s manager Garrett Brancy runs a tight ship. 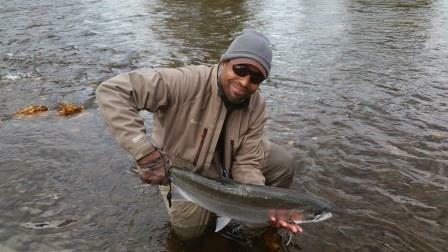 DSR as its known, belies the stereotypes of the combat fishing perception this river has. Yes, you’ve got to work hand in hand with your guides to stake out some water early and essentially park there to hold your spot in the river. And yes, you’ll see lots of sports on the water (solitude this ain’t). However, DSR is catch-and-release, has several riverwalkers to ensure regulations are being followed, and a very comfortable reservation system that creates fairness among anglers. An interesting fact, the Barclay family opened DSR as a private water sport fishery in 1989. The property has been in the family since 1807, when it was settled by Colonel Rufus Price, an aide-de-camp to General George Washington during the Revolutionary War. The Barclays advocate sound environmental practices in fisheries, farming, forestry, and natural resources management and are heavily involved with how the Salmon river is managed by the State. With a very affordable day rate, I recommend you use DSR on your visit to the Salmon, especially if you are a fly angler. DSR is also a TU endorsed business and the same family is behind the new line of rods and reels from Douglass Outdoors. 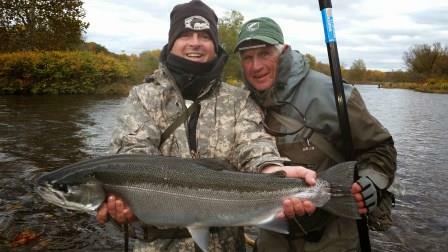 DSR has top notch guides who are experts in single and double-handed spey casting. We were most fortunate to hook up with Mike DeRosa and Dave “Rocky” Rockwell of Zero Limit Adventures who got us up early and on the water in the best position to fish by no later than 5am. Mike was one of the best guides I’ve ever had frankly – he was a patient instructor and guide and got 3 guys spey casting within just a few short hours. 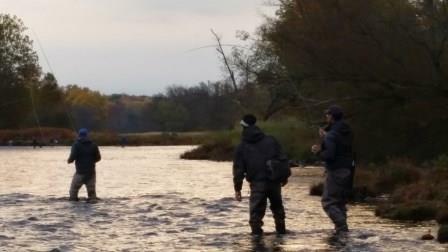 Importantly, he gave us the necessary tips to hook and land big fish. Sure, learning the fundamentals on the water cost us a few fish initially, but the river had more than enough to spare and soon we were into steelhead that would come in waves throughout the day, following the big chinooks that ran upstream often in front and behind us. 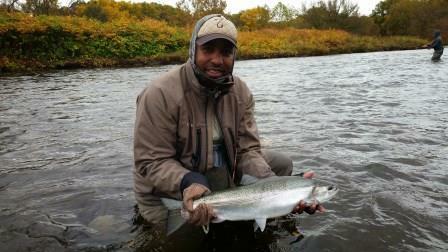 Though it was cold and overcast, and often wet, we barely noticed it because we were so dialed-in to the fish. 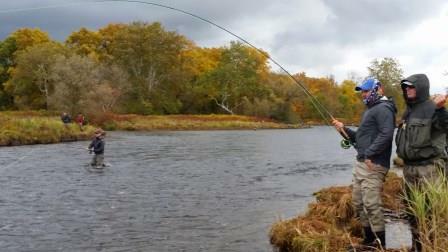 Our 11′ 7wt switch rods would zip out line in a steady rhythm between roll casts and spey casts. The line would come taut as our guides nymphs were sucked down by compliant chromers. Many fish were brought to hand by each of us. In true fish-story fashion, at the very end of the second day after hot and heavy fishing, I had taken a long break to sit back and watch my buddies fish. 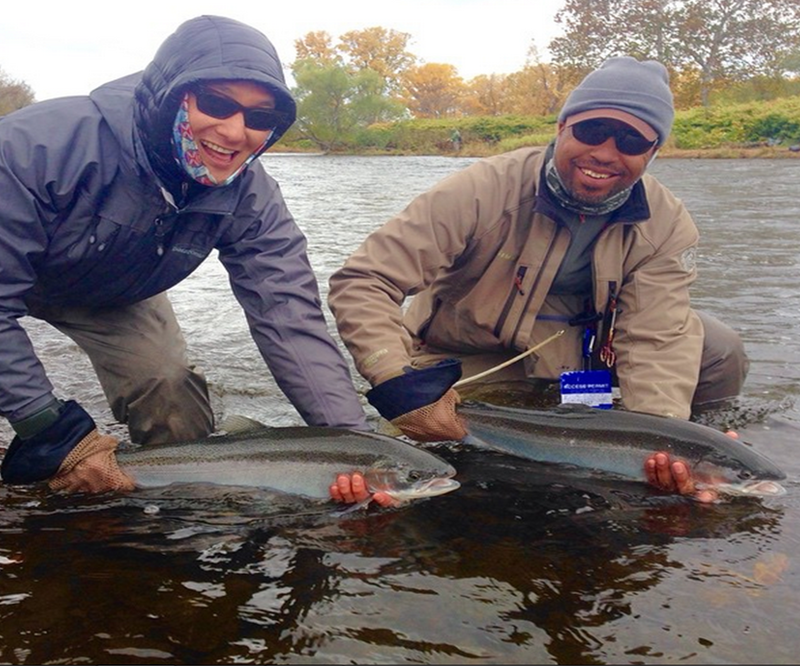 I wanted to savor the moment and eventually went for the proverbial “last cast” and caught my largest great lakes steelhead of the trip. Rocky yelled “big fish! 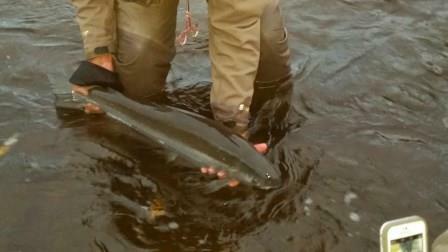 big fish!” when the feisty rainbow cartwheeled twice out of the water and then zipped downstream. We were desperate to keep her out of the rapids. With a dive Rocky went in and netted here. Words failed us all as we just soaked in the moment. I know we were lucky, that this type of fishing just doesn’t happen often, but I figured you know what, maybe I as due. I’ve prayed to the fish gods long and hard these many years, and all I really wanted was for my friends to have a good time. I smiled down on the steelhead before me, and gently released her back in the water, thanking God for such creations on this beautiful earth. And I think he smiled back on us.